Best Walking Shoes For Travel: Do You Really Need It? This Will Help You Decide! Whether you're trekking, sporting or traveling, the kind of shoes you wear dictate how comfortable your jaunt will be. With a raft of shoes out there, the problem comes in when deciding to pick the right kind of shoes. Comfort, fashion, activity, and personal preference are key factors to consider when going for a new shoe. You can decide to go for shoes that are stylish or trendy, but it is also paramount to consider comfort, especially when your journey will last for quite some time. The shoes that you put on will profoundly determine how you travel along. With apt travel shoes, you will be able to enjoy your trip. You may not like the experience if you happen to select your shoes wrongly. During the journey, the two most paramount companions to you are your feet; they will enable you to choose the path that you will follow. Despite having this knowledge in mind on the importance of our feet, many still make the mistake of taking with them shoes that can lead to discomfort. Wrong shoe choice leads to severe pain in the feet especially if part of the travel will involve walking. Another mistake made is over packing lots of shoes which results to many being returned unworn. The following are factors that one will consider when choosing travel shoes. This should be put into consideration when selecting shoes. One should go for those who are not affected by weather. Though weather patterns keep fluctuating, it will be imperative to have a review of the predicted temperatures and weather trends of where you are planning to visit. In case you will expect rain, it is paramount that you carry waterproof footwear or any other quick-drying material. If the temperature is predicted to be warm, it's good that you choose well-ventilated shoes like those with breathable uppers. After analyzing the weather conditions, ask yourself, what's my activity? Do I require sports footwear or those trendy Louboutins? You should take stock of the activities you plan to undertake. This means that you can have a crossover between your current shoes and your leisure shoes. Some activities such as hiking, rock climbing, and cycling require appropriate footwear. When packing, you can pick one pair that has specific activity and also include one that can quickly change from day and night. When choosing shoes, one should also consider selecting shoes that are versatile. These are multitasked shoes that you can wear for several purposes. Check out for shoes that can be put in the evening and also styled down to wear throughout the day. Look for a style that can match from trailhead to the city street not forgetting that color is equally essential to making your shoe a versatile one. When shopping around, whether online or in your local store, check for the comfort of a shoe. For long treks, flat-bottomed shoes will be ideal. Comfort actually rests on an individual, but factors such as material and internal shoe lacing are universal across the board. Moreover, you need to consider things such as the arch support, flexibility and lastly the toe box – find shoes that will provide enough space in the toe box. Some areas you visit will force you to have sturdier shoe especially if the area is rugged terrain or one that has extreme weather. With a previous experience, you can be able to select a shoe that fits the kind of place you're about to visit. Women can accessorize well when planning for their weekend jaunts, unlike their male counterparts. Women will dress up to impress, that is why they are always updated on what new in the market. If you’re a lady, go for the trendy and comfortable shoes. Men mostly go for durability rather than fashion. Regardless of your gender, you need to know that today’s shoes feature great elements like shock absorption, memory-foam insoles, and breathable fabrics. Emerging trends right now in the shoe industry are one that focuses on responsible travel, and this applies the product that we decide to settle for. Well designed shoes provide for both quality and also comfort. You should not go anywhere with a shoe that is not waterproof. It is important that you consider this because regular shoes are prone to spoiling the beautiful moments whenever they get into contact with rainwater. Best shoe designs not only ensure that you're comfortable throughout your expedition, but they also showcase your personality. Everyday people fill shops and shoe centers to buy new shoes. Looking good is the primary objective of everyone. For quite a long period, there has been a debate between comfort and style. Trends in fashion travel, everyday flats, and orthopedic designs might make you end up cropping the photos you took during vacation. It's good to stay stylish while traveling and that's why you must choose a well-designed shoe for travel. As the name suggest, this shoe is designed for men, and it comes in a variety of colors for you to choose from. It is made of textile and rubber sole for protection. Its memory-foam cushioned heel measures is about 1.5”. This Go Walk 3 Slip-On Walking Shoe features solid slip-on construction for easy on/off. It’s a lightweight walking shoe featuring a meshed upper fabric. For comfort, the shoe comes with full-length GOga Mat insole. To reduce pressure on your feet, this Skechers shoe has been made with GOga and Resalyte technology that ensures comfort when you’re in lengthy strolls. Made from leather and rubber sole, the Mw928v2 has full grain leather upper and a comfortable tongue. The shoe also features the light and flexible EVA technology to ensure that is designed to provide stability against over-pronation. If you’re an athlete, this is the right shoe for you. With the collar foam and rubber sole, you’re assured of comfort throughout the day. This New Balance shoe has been crafted and designed based on the needs of athletes. The rubber sole provides rebound properties for takeoff while the EVA compression ensures ultimate protection of your feet while running. While it’s hard to find a good therapeutic shoe, Dr. Comfort Douglas shoe got you covered. With a classic craftsmanship and sophisticated style, this therapeutic shoe helps those people with swollen feet (mostly due to diabetes). Just like other Lycra models, the shoe is not only crafted for longevity but also for comfort for anyone with swollen feet. The stretchable Lycra enables you to enjoy the comfort of the shoe regardless of your condition. These Merrell’s hiking shoes are made from leather fabric and rubber sole to cushion your feet when hiking in the rugged jungle. It comes in two colors; black and brown. It is a durable shoe for hiking featuring stretchy topline and bungee laces for a perfect fit. The padded collar featuring a pull tab ensures that the shoe firmly grips onto your feet. Like the Mw928v2 Walking Shoe above, it’s made of EVA footbed for protection from jagged objects and stony trails. To reduce odor, Merrel included the M-Select FRESH technology and a breathable mesh lining. The Eureka Walking Shoe come is made of leather and synthetic sole for durability. The moisture-wicking mesh lining makes the show breathable thus preventing odors. The Rockport’s San Crispino technology used in making the heels ensures stability and comfort at all times. It’s a casual shoe which can fit for any occasion. The latex footbed provides comfort during long walks while the Strobel technology provides for forefoot flexibility. Eureka's biomechanically designed outsoles not only provides flexibility but it also ensures a firm grip on various surfaces. The MW769BR New Balance shoe is made from 50% leather and 50% suede and rubber. The New Balance trail shoe provides great traction whether you’re walking on soggy grass or rugged terrains. For more comfort and support for your feet, the shoe’s midsole is cushioned ABZORB shock-absorbing technology. MW769BR Walking Shoe is designed to be lightweight so that you can carry on with your hiking and mountaineering without feeling foot fatigue. The lugged outsole provides ultimate protection when walking on any type of landscape. If you’re prone to flare-ups, then this is the right show for you. The Clarks are renowned shoe manufacturers, and certainly, they didn't disappoint when crafting this men's shoe. It’s made of a leather synthetic sole and features twin elastic gores, for ultimate foot support. You can use it for your official and casual occasions. Also, you don't have to worry about comfort as the shoe features a shock-absorbing midsole. The rubber sole provides firm grip and stability. It's an easy to wear show because of its slip-on design. The breathable sole gives bad odor at bay while the padded collar and its lightweight nature make the shoe an ideal choice for most men. Good simple walking shoes are usually best especially when taking light walks around cities. They come in variety sizes, color and for both for men and women also. T﻿he best shoes for walking is these are shoes made from leather, textile or leather synthetic material featuring high-density foam. Some shoes can also have adjustable straps while others feature slip-on designs. Others feature EVA compression technology, others feature PU technology but either way, the main goal of these technologies is to make the shoes more comfortable. Shoes are also made based on their use; some are specifically made for sporting, others for short walks, others for hiking and others for official occasions. Walking shoe factor – If you have a casual approach, your options will be vast. This is simple, just select a shoe that matches places where you will be doing most of your walking. ​Flexibility and support – When you want to know if a shoe offers unprecedented flexibility, you can pick up a shoe by the heel and bend the toe upward or instead twist the shoe sole from the heel to the toe. If it folds up easily, then that shoe is good for walking. ​Cushioning – When you walk there is less impact on your feet compared to when you are running. Due to this, a good walking shoe does not require as much cushioning under the ball of the foot. Shoe Weight – This is important when buying shoes especially if your target is fitness. Also, It is advisable that you go for lightweight shoes if you are frequently affected by foot fatigue. Wear your biggest shoes- this is to ensure that you have saved some space in your suitcase so that you can carry something else that is essential. Don't lie about working out-Sometime you may make decisions while you are psyched up that will take full advantage of the hotel gym to keep health and end up filling your suitcase with a lot of athletic shoes which you will probably not use them. Don't pack brand new shoes –Argument sometimes arises on whether it is appropriate to wear new shoes or not, some wear them almost immediately they are out of the box, however, this is risky because they may break anytime. What’s the price of certain shoes? How do I know a shoe offers comfort and stability as advertised? Should I buy a lightweight shoe? Yes, that’s if you’re prone to foot fatigue. What are some of the characteristics of a good shoe? Good shoes are made with robust materials and it features one or more technologies and designs that provide comfort. Good shoes have midsole shock-absorbers and a technology or craftsmanship that reduces odor. 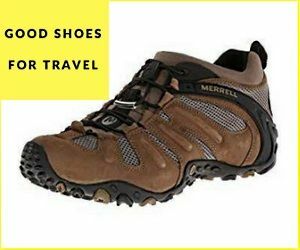 After discussing best walking shoes for travel, it is clear that these shoes are essential and they come with different features depending on one's preference.